The five Lok Sabha seats that go to polls in the first phase on April 11 are Tezpur, Kaliabor, Jorhat, Dibrugarh and Lakhimpur. Altogether 45 candidates have filed their papers for the five Lok Sabha seats in Assam till Monday, the last date for the filling of nomination for the first phase of parliamentary polls in the state, officials said. In Tezpur, 10 candidates, including state minister Pallab Lochan Das of the BJP and retired bureaucrat M G V K Bhanu of the Congress have filed their papers, officials said. In Kaliabor, seven candidates including sitting Congress MP Gaurav Gogoi and AGP's new entrant Moni Madhab Mahanta have filed their nomination papers. In Jorhat, eight candidates including state minister Tapan Gogoi of BJP and former Congress MLA Sushanta Borgohain have filed their papers. In Dibrugarh, sitting BJP MP Rameswar Teli and former Union Minister and Congress veteran Paban Singh Ghatowar are among the eight candidates who have filed their nomination papers, they said. In Lakhimpur, sitting BJP MP Pradan Baruah and Anil Borgohain of the Congress were among the 12 candidates to have filed their papers. The scrutiny for the five Lok Sabha seats will be held on March 26 and the last date for withdrawal of candidature is March 28. Fourteen nominations have been also filed for the five Lok Sabha constituencies - Karimganj (SC), Silchar, Autonomous District (ST), Mangaldai and Nowgong which goes to polls in the second phase on April 18. Prominent candidates who filed their nominations for the second phase include sitting Congress MP from Silchar Sushmita Dev and her rival Rajdeep Roy of BJP, sitting AIUDF MP from Karimganj (SC) Radheshyam Biswas, sitting Congress from Autonomous District (ST) Biren Singh Engti. The last day for filing of nominations for the second phase is Tuesday and scrutiny is on March 27 and the last date for withdrawal of candidature is March 29. 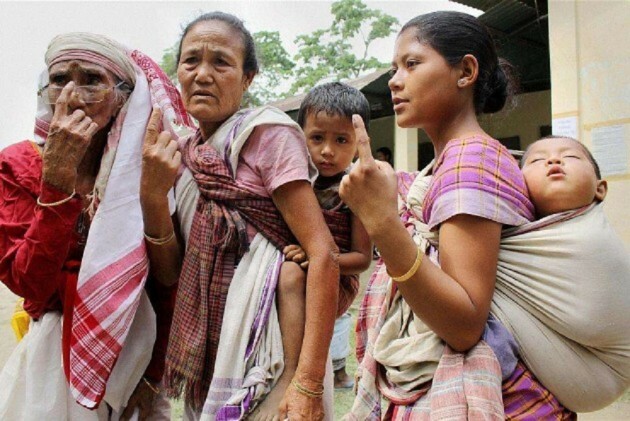 Polls for the 14 Lok Sabha constituencies in Assam will be held in three phases - five in first, five in second and four in the third and final phase on April 23. In 2014 Lok Sabha polls, the BJP had won seven seats, Congress three, AIUDF three and an Independent candidate one seat in Assam.